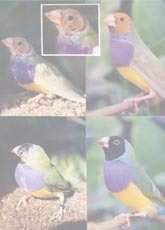 © ladygouldianfinch.com 1999 Great Gouldian Gift Idea! 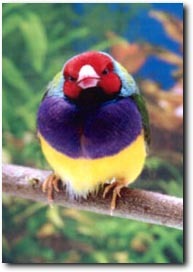 Gouldian" Better stay on this Grumpy Gouldian's good side! Bringing a smile to everyone who sees it, this amazing photograph reminds us that a gouldian can be grumpy! "..just got my Grumpy Gouldian photo, and I just have to tell you it's the cutest thing I've ever seen!" "The Grumpy Gouldian" - will bring a smile to everyone who seems him! 8" x 10" Photograph print.